Search for all "Bromodeoxyuridine / BrDU"
Rat anti Bromodeoxyuridine / BrDU BU1/75. Product is tested for Immunocytochemistry/Immunofluorescence, Flow Cytometry, Paraffin Sections. 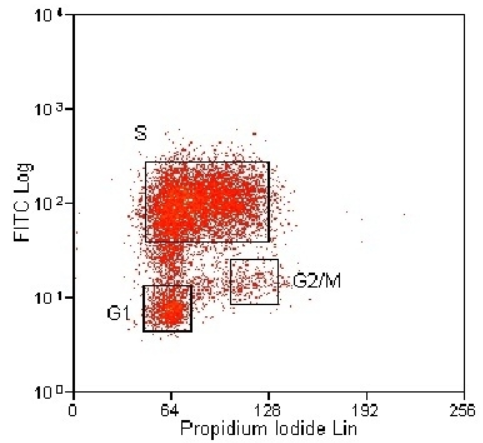 Flow Cytometry: Use 20 µl of 1/25-1/200 diluted antibody to label 106 cells in 100 µl. Membrane permeabilization is required (See protocol below). 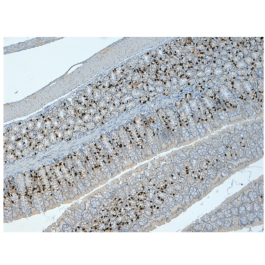 Immunohistochemistry on Formalin-Fixed, Paraffin-Embedded Sections: 1/25-1/200. Denaturation of the DNA is critical for successful staining of BrdU. This can be achieved by exposing cells to heat or acid. For heat-induced epitope retrieval, 10 mM citrate buffer pH 6.0 is recommended. Alternatively, a 30 min incubation in 2M HCl can be performed. The HCl must then be neutralized for 2 min with 0.1 M Na2B4O7. Pre-treatment of tissues with proteinase K should be avoided. As a Positive Control, BrdU labelled cells maybe obtained from Phoenix Flow Systems (http://www.phnxflow.com), catalogue number ACNC12. 1. Add BrdU to the cell suspension in culture medium to a final concentration of 10 µmol/L and incubate for 30 min in a CO2 incubator at 37°C. 2. Wash cells twice with PBS/BSA by centrifuging at 500g for 10 min, decant supernatant and resuspend in a miniumum volume of PBS. 3. Add cells slowly into 5 ml of 70% ethanol at -20°C, mixing continuously (vortex preferred). Incubate on ice for 30 min. 4. Centrifuge at 500g for 10 min, decant supernatant, and resuspend cell pellet. 5. Add 2 ml of 2N HCl containing 0.5% Triton X-100 and incubate the cells for 30 min at RT (preferably on a rocking platform). 6. Centrifuge at 500g for 10 min, decant supernatant and resuspend in 3 ml of 0.1 M Na2B4O7, pH 8.5. 7. Centrifuge at 500g for 10 min, decant supernatant and resuspend the cells in PBS/BSA + 0.05% Tween-20. Adjust cell concentration to 1 x 107/ml. 8. Aliquot 100 ul of cell suspension into required number of 12 x 75 mm tubes. 9. Incubate the cells with the BrdU antibody at the recommended dilution for 30 min at RT. 10. Add 2 ml of PBS/BSA and centrifuge the cells at 1000 rpm for 5 min. 11. If a secondary antibody layer is required then decant the supernatant and incubate the cells with the secondary antibody for 30 min at RT. If no secondary antibody layer is required then proceed to step 13. 12. Wash the cells by repeating step 10. 14. Analyse cells by Flow Cytometry following the manufacturers instructions. The PI should be read on the appropriate channel set to the Peak/Area and not log scale. 1. Vanderlaan, M. & Thomas, C.B. (1985) Characterization of monoclonal antibodies to bromodeoxyuridine. Cytometry. 6: 501-505. 2. Ghiringelli, F. et al. (2005) Tumor cells convert immature myeloid dendritic cells into TGF-beta-secreting cells inducing CD4+CD25+ regulatory T cell proliferation. J. Exp. Med. 202: 919-929. 3. Dolbeare, F. (1995) Bromodeoxyuridine: a diagnostic tool in biology and medicine, Part I: Historical perspectives, histochemical methods and cell kinetics. Histochem. J. 27: 339-369. 4. Das, G. et al. (2009) Cyclin D1 fine-tunes the neurogenic output of embryonic retinal progenitor cells. Neural Dev. 4: 15. 5. Nakhai, H. et al. (2008) Conditional ablation of Notch signaling in pancreatic development. Development. 135: 2757-65. 6. Ghai, K. et al. (2010) Notch signaling influences neuroprotective and proliferative properties of mature Müller glia. J Neurosci. 30: 3101-12. 7. Amador-Arjona, A. et al. (2011) Primary cilia regulate proliferation of amplifying progenitors in adult hippocampus: implications for learning and memory. J Neurosci. 31: 9933-44. 8. Bugler, B. et al. (2010) Unscheduled expression of CDC25B in S-phase leads to replicative stress and DNA damage. Mol Cancer. 9: 29. 10. Xu, Q. et al. (2010) Sonic hedgehog signaling confers ventral telencephalic progenitors with distinct cortical interneuron fates. Neuron. 65: 328-40. 11. Zhang, J. et al. (2010) A powerful transgenic tool for fate mapping and functional analysis of newly generated neurons. BMC Neurosci. 11: 158. 13. Knopf, F. et al. (2011) Bone regenerates via dedifferentiation of osteoblasts in the zebrafish fin. Dev Cell. 20: 713-24. 14. Grotek, B. et al. (2013) Notch signaling coordinates cellular proliferation with differentiation during zebrafish fin regeneration. Development. 140: 1412-23. 16. Kroehne, V. et al. (2011) Regeneration of the adult zebrafish brain from neurogenic radial glia-type progenitors. Development. 138: 4831-41. 17. Liu, M.T. et al. (2009) 5-HT4 receptor-mediated neuroprotection and neurogenesis in the enteric nervous system of adult mice. J Neurosci. 29: 9683-99. 18. Lundgren, O. et al. 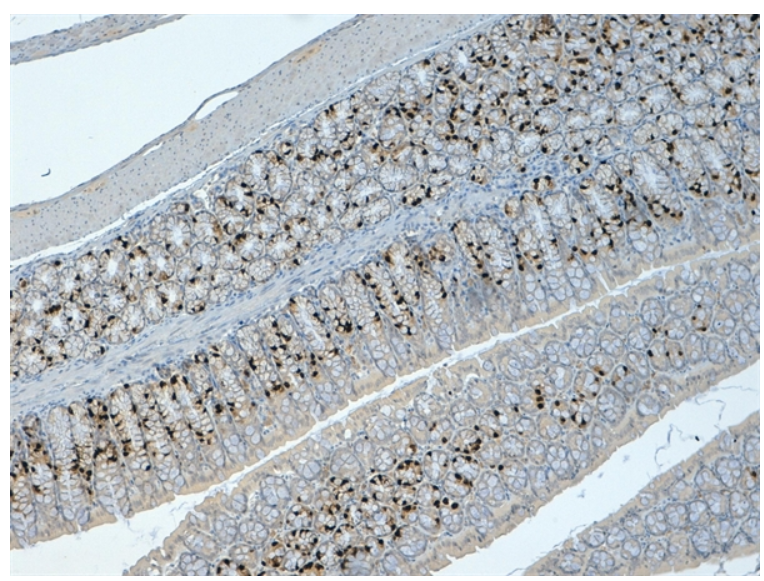 (2011) Intestinal epithelial stem/progenitor cells are controlled by mucosal afferent nerves. PLoS One. 6: e16295. 20. Puverel, S. et al. 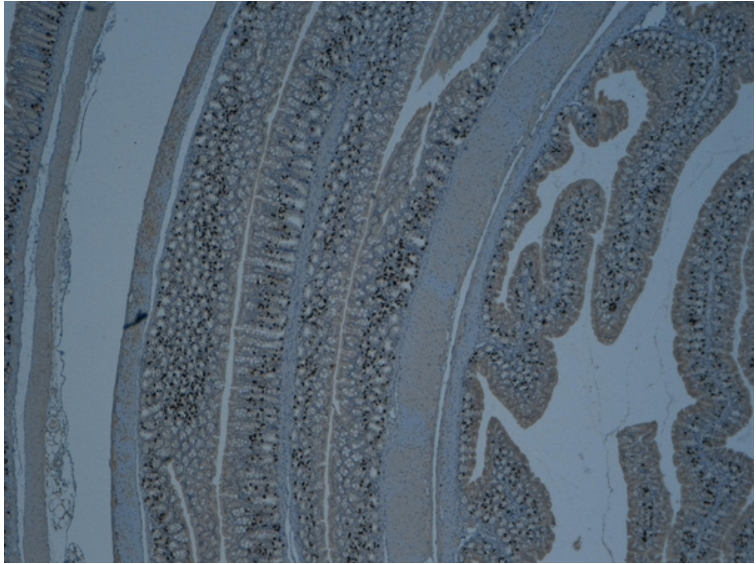 (2011) RanBPM is essential for mouse spermatogenesis and oogenesis. Development. 138: 2511-21. 21. Sabo, J.K. et al. (2011) Remyelination is altered by bone morphogenic protein signaling in demyelinated lesions. J Neurosci. 31: 4504-10. 22. Scheys, J.O. et al. (2011) Evidence of adrenal failure in aging dax1-deficient mice. Endocrinology. 152: 3430-9. 26. Maden, M. et al. (2013) Proliferation zones in the axolotl brain and regeneration of the telencephalon. Neural Dev. 8: 1. This antibdoy reacts with BrdU in sigle stranded DNA, BrdU attached to a protein carrier or free BrdU. The antibody detects nucleated cells in S-phase with have had BrdU incorporated into their DNA. It also reacts with Chlorodeocyuridine but with reduced staining. The antibody does not cross react with Thymidine.